ASTM B677 TP 904L SS Seamless Pipes Suppliers, 904L Pipes Manufaturer, Cold Drawn Pipes Stockholder, SS 904L Pipes Exporter in india. MBM Tubes is one of the well-known stockist, exporter, manufacturer, stock holder and supplier of a qualitative range of Stainless Steel 904L Seamless Pipes. Costs of our 904L Pipes are affordable and pocket-friendly. Cold Drawn 904L Pipes are very much easy to install and remove, and can be available for our clients in different technical specifications of threading and sizes. 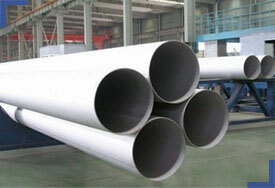 Cold Drawn 904L Pipes are designed as per international and national standard quality of raw materials. Stainless Steel 904L Pipes are having some significant features like high resistance to crevice and pitting corrosion, first-rate resistance to stress corrosion cracking, superior weldability and formability. We focus in manufacturing special size and custom shape products for our clients. Schedules : SCH. 5, 10, 20, 30, 40, 60, 80, 100, 120, 140, 160, XXS. Stainless Steel DIN 1.4539 Seamless Pipes Stockist, SS UNS N08904 Seamless Pipes, SS 904L Cold Drawn Pipes, SS 904L Seamless Pipes, SS 904L Seamless Pipes in India. Copyright © 2015 MBM TUBES PVT LTD. All rights reserved.